Zero, the witty donkey, is back with this latest collection of hilarious cartoons and caricatures on the who's who of our 'politickle pickle'! This time Zero focuses on the Great Indian Elections. With the deft strokes of a cartoonist's brush, Zero splashes the canvas with sharp satire, resulting in yet another collector's item that's guaranteed to leave you in splits! The rib-tickling sequel to the bestselling volume of cartoons. Shreyas Navare freelances as editorial cartoonist, Hindustan Times and is a fellow on international affairs at Harvard University. He holds an MBA from IIT Bombay and a Bachelor's degree in engineering (Information Technology) from VJTI, Mumbai University. Previously, he has worked at a private bank for five years in marketing and technology. On behalf of HT, Shreyas has covered elections in six Indian states and presidential polls in the US. His works have been exhibited in India and abroad. 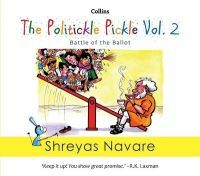 His first book of cartoons, The Politickle Pickle, was published by HarperCollins in 2013.